To donate, please make a wire transfer with following information or make donation by credit card. The Fukushima Poka Poka Project ("refreshment camp" for children from Fukushima) has been providing a place where children affected by the 2011 Fukushima nuclear accident can freely play under the sun, and a space where parents can freely talk about their concerns about radiation. In the past three and half a years, more than 700 children and parents have participated in the weekend refreshment camp in Inawashiro in the mountains of Fukushima Prefecture. This location is accessible for many parents in Fukushima and is safe, with low radiation levels. Thanks to donations from supporters last year, we were able to rent a cottage there. We named it the “Poka Poka House” (meaning "warm"). The Poka Poka House also provides the opportunity to receive medical advice from local doctors about reducing radiation exposure and increasing immune system strength, and to share information about radiation monitoring where people live. Mothers and fathers are able to talk to each other about shared concerns, and children are able to play and grow strong. April 2016, some alumni of the Poka Poka Project went to Germany to participate in ten days of an exciting and fruitful program with German and Belarusian students. They came back and showed how they grown up through this program. They have also become dedicated volunteer staff to run the program. To continue the Poka Poka Project, we are calling for donations. 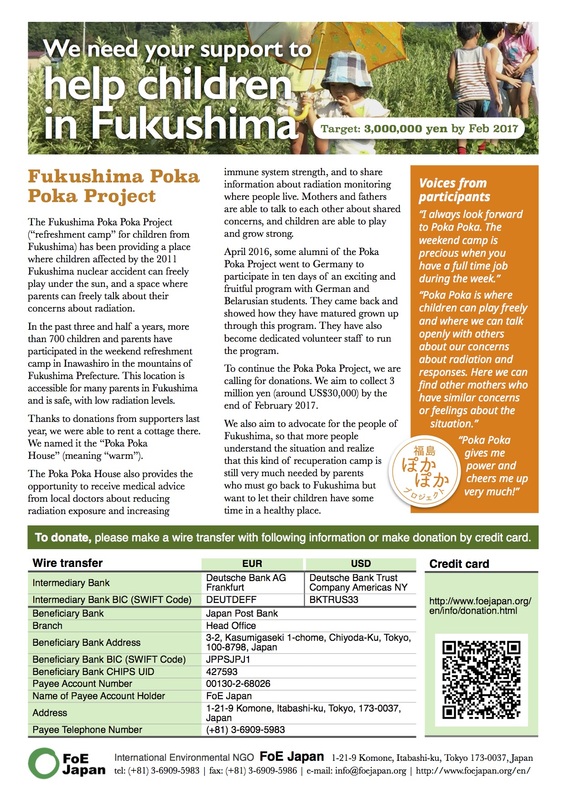 We aim to collect 3 million yen (around US$30,000) by the end of February 2017. We also aim to advocate for the people of Fukushima, so that more people understand the situation and realize that this kind of recuperation camp is still very much needed by parents who must go back to Fukushima but want to let their children have some time in a healthy place. For just 10,000 yen (US$100), a child can participate in a three-day camp at Inawashiro.